Olivetti is known for the eccentricity of its early machines (M20, M24). The M10 is no exception. 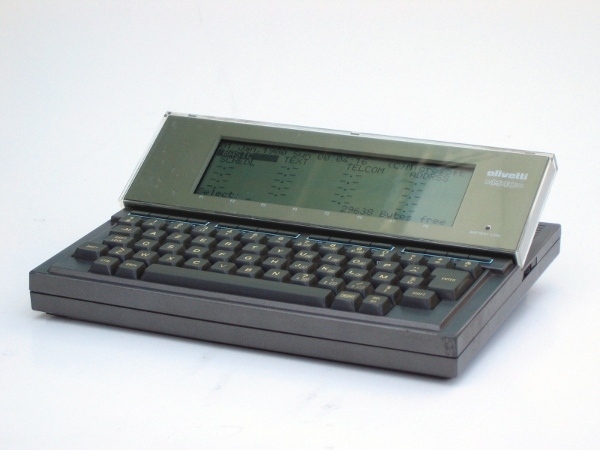 Altough very similar to the Tandy M100 family (Both come from Kyocera), some features are different. On the outside, there is the display, that can be set at an angle with the keyboard. Outside The Olivetti M10 is an early attempt to make a real portable computer. All logic is CMOS, and it can run several hours on four standard penlight batteries. This is a French keyboard setting. On the whole the M10 is compatible with the Tandy M100 for basic programs, but not on ROM level. 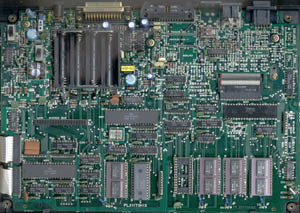 Inside The M10 uses the same wierd RAM chips as the Tandy M100. Other common features are a parallel, serial, modem (option), cassette and BCR (no, not a weapon but barcode reader) interface. Back For some reason the Printer connector pin out is the most wide spread piece of info on the M10. Rom data I once tried to start the M10 with a M100 rom. It almost worked, but at least the keyboard mapping is different. If someone wants to investigate the differences, here are the ROM images of both. here I found some info on the differences. Physically there is also a difference in pinout. The M100 rom is propetairy, the M10 rom pinout is compatible with the 27C256 EEPROM. I did some disassembly and compared it with the well documented Tandy M100 rom. Allmost all 'IN ' and 'OUT ' are the same, so we can conclude the I/O-devices are on the same ports. The exception is the modem port on A0H, which isn't present on the M10 board either. Operating Guide First chapters with preliminary formatting. Quick reference guide similar to Operating Guide, but shorter (and better formatted). Conversion by Tiziano Garuti. Tandy M100's Club 100 Here is where I found the M200 documentation. File transfer program between Win9x and the M100, 102, 200, NEC 8201..